Mr. Johnson received his bachelor's degree from Middle Tennessee State University in Criminal Justice Administration in 1975 and his law degree from the Nashville School of Law in 1980. Following his graduation, he served as a law clerk to Judge Charles O'Brien on the Tennessee Court of Criminal Appeals and then as a law clerk to Justice George Brown on the Tennessee Supreme Court. Thereafter he went into private law practice and has maintained that through the present. Mr. Johnson has been a principal in "Johnson, Scruggs & Barfield" since its inception in 1997. He maintains a general practice where he handles both civil and criminal matters. 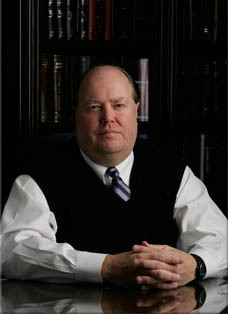 In his civil practice, while he has obtained $1,000,000 plus settlements/judgments against Fortune 500 companies, it is his loyalty and diligence in representing the individuals in everyday civil matters such as insurance claims, workers compensation, personal injury, wills, probate and civil litigation that brings him the greatest reward and satisfaction. In his criminal practice, he has found one common element that rings true for most of his clients - that element being that good people get caught up in bad situations and find themselves in need of legal representation - which he diligently provides by lending his assistance and guidance on a personal level. He is either currently a member of or has been a member of the Nashville Bar Association, Tennessee Bar Association, American Bar Association, Tennessee Trial Lawyers and/or the Trial Lawyers of America. He is admitted to practice in all of the state and federal courts in Tennessee as well as the Sixth Circuit Court of Appeals and the United States Supreme Court.